There are two excellent resources available for free that discuss whether you should charge hourly or fixed cost. 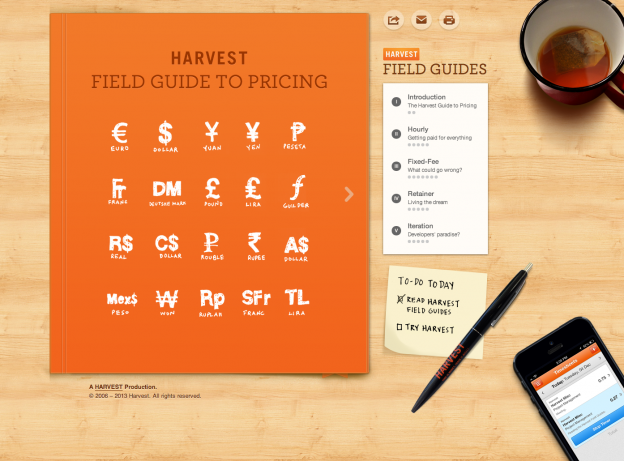 The first is a free online book from Harvest called The Harvest Guide to Pricing. The second is an eBook from FreshBooks called Breaking the Time Barrier. The book from Harvest can be broken down into the following topics: hourly, fixed-fee, retainer, and iteration. The Harvest book appears to be saying that a client-retainer model is the best option long-term if you’re going to be doing a lot of business with a single client, and frankly I agree. It resolves a lot of issues that can pop up with a client that is doing a significant amount of work on a monthly-and-ongoing basis. Retainers give you more access to the client, more flexibility in what you produce, and allow you to (somewhat) get off the exhausting new business cycle. But they don’t always last forever, depending on the quality of the work or the clients’ revenues. You can’t get too comfortable or else you’ll under-deliver, and you need to have a diverse set of clients so that you’re not too reliant on any one retainer. The book from FreshBooks is written in the style of The E-Myth, and is even endorsed by Michael Gerber. This book definitely endorses the idea of charging for value, not time. Anyways, I just wanted to bring these two resources to your attention!